When looking for a GMC conversion van for sale, it may seem as if your options are limited. No matter what you are looking for in particular, GMC conversion vans simply aren’t as easy to find as RAM vans. 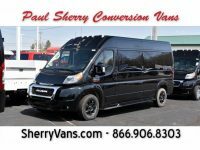 Luckily, Paul Sherry Conversion Vans is here to help. We pride ourselves on offering all types of conversion vans, including those from GMC, so you are able to get exactly what you want. 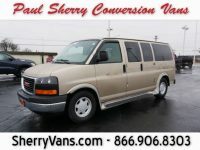 At any given moment, our inventory at Paul Sherry Conversion Vans includes at least several different used GMC conversion vans for sale. This inventory is constantly being updated as we find additional used models in the area that are in good condition. Between trade-ins and buying conversion vans, our inventory is always evolving. Even so, you will only find GMC conversion vans for sale that are in good condition. 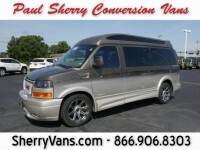 Whether it is new or used, we hold these vans to the same high standards we do all other vehicles on our lot. This way, we can ensure you are satisfied with your purchase. If you currently have a conversion van for sale, or even other vehicle and want to trade it in for your GMC conversion van, we can help. Just contact us or fill out the online form that will estimate your conversion van’s value. Remember that if you want us to accept a trade-in or buy your van, it should be in reasonable condition. This way, we are able to offer a good price while still providing our other clients with quality vehicles. Since GMC conversion vans tend to cost more than regular sedans and other smaller body styles, Paul Sherry Conversion Vans is happy to offer financing for our clients. We work with multiple lenders, ranging from small, local credit unions to large, national banks. This way, we can use our resources to get you a loan rate that fits your budget, regardless of your credit rating. The process of applying for financing is incredibly straightforward, and you can even get started online without having to visit us in person. Don’t worry about filling out the form; doing so won’t affect your credit rating. It just gets the ball rolling on a loan. Since GMC conversion vans for sale can sometimes be a challenge to find in certain areas, we offer delivery to your location. This way, you don’t have to drive hours and hours to find the perfect conversion van. We will gladly calculate the shipping costs for you; just give us a call and let us know which conversion van you want to buy and where it will be sent. We can deliver the van to any one of the fifty states, so you don’t have to be close to our Piqua, Ohio, dealership to buy from us. 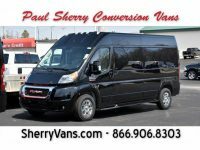 No matter what you are looking for in your GMC conversion van, Paul Sherry Conversion Vans is here to provide it. With a range of seating configurations and special conversions such as those that are wheelchair-friendly, we should have something to meet your needs. Check out our online inventory or come visit our dealership.